Reaching preteens can be tough. Here’s some help. This is a great Christmas lesson that is sure to impact the preteens in your ministry. It’s fun, experiential and adaptable to any ministry setting. Preteens will dig into the true meaning of Christmas. Enjoy! Divide everyone into 3-5 teams. Have a half dozen (or more) boxes wrapped, each with something that makes noise when shaken inside (make sure each box is different). Shake the box and have each team decide what they think is inside. Have someone come up and open the box and see who wins each round. Give everyone well-known Christmas songs, only leave some of the words blank (mad lib style) and have everyone rewrite the songs. Or if they’re up for an extra challenge, have them create their own words to a completely new verse to the songs. Shepherds, angels, and no room in the inn. This is where our new kind of Christmas becomes a bit more familiar. And this is where God does something completely unexpected: God becomes a human baby, born with sheep and cows (not what you’d expect for the King of Kings) and celebrated by lowly shepherds (not who you would expect to give him his first “hello”). This is God with us (Immanuel) in a whole new way, in a way you would least expect. Because in Jesus, God keeps showing up where we least expect it. God is with us when we least expect it. Who can tell me what the word Immanuel means? let a student answer] It means “God with us” and this is what Christmas is all about. God was with Adam and Eve in the garden, God was with the people of Israel in a tent, and today we will explore how God is with us in a newborn baby. But before we get too far ahead of ourselves, let’s talk a bit about who has the power. This is our power-o-meter. draw a vertical line on the chart] At the top is the most powerful [write “powerful” at the top] and at the bottom is the weakest [write “weakest” at the bottom]. Now, where do you think a baby would fit on our power-o-meter? have students call out their answers, then write “baby” at the bottom] Exactly, a baby is powerless. They need other people to care for them. Without a family, how does a baby do anything? And then what about a king? Where would a king go on our power-o-meter? have students call out their answers, then write “king” at the top] A king would be at the top, because a king is the one in charge. A king is the one who can say something and then everyone does it. The king sits at the top of it all, ruling over everything and everyone. The king has all the power. We have Mary. We have Joseph. And we have a hotel with no vacancy. And so after their long journey from Nazareth to Bethlehem, Jesus is born. This story starts with an emperor and ends with a baby. It starts with the person who is supposed to have all the power, at least according to our power-o-meter, and ends with a powerless baby. Only this baby isn’t powerless, because this baby is God with us. You wouldn’t expect God to be born out back next to a donkey. You would expect God to sit on the emperor’s throne. But this is a new kind of Christmas. And it’s a new kind of power—one that we don’t always expect. 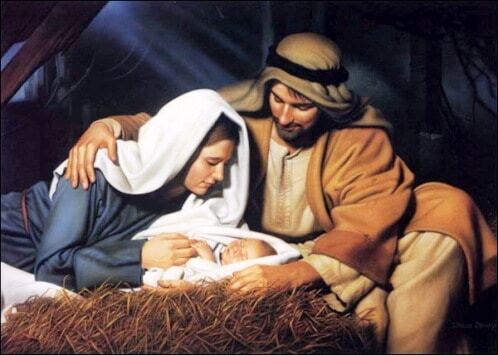 This power is Immanuel, God with us, born as a baby. This baby is Jesus. The angels come announcing the birth of the king. Only they skip the Emperor’s palace. They skip the evening news. They skip everyone who should be the most powerful. And they go to shepherds. If we put shepherds on our power-o-meter, they would be way at the bottom, just above a baby. “Shepherd” was the job for a kid. “Shepherd” was the job no one else wanted. It was a smelly and tiring job. But God tells them first. They run through the street telling everyone about this unexpected baby, about the Messiah, about Immanuel, about God with us, about Jesus. And we don’t always see it coming. About thirty years after Jesus’ birth, a couple other people didn’t see it coming. They were on a seven-mile walk, heading home from Jerusalem because Jesus had just been killed. As they are walking, a man joins them. This stranger doesn’t know what just happened—that Jesus had been killed. They share this tragic news with him as they continue on their seven-mile walk towards home. The stranger, however, turns out to be smarter then they had thought. And he begins to tell them all about the Messiah and all the things the prophets said about him. They come to Emmaus and the stranger is going to keep walking. Only it’s getting late so they invite him to join them for a meal. And it is here, at this meal, that the stranger breaks bread and blesses it. And then suddenly they recognize him. He’s not a stranger to them anymore. He is Jesus. And in that same moment he is gone! The whole walk from Jerusalem to Emmaus, Jesus had been with them—Immanuel! They run the seven miles back to Jerusalem to share the good news that Jesus is alive. Imagine how the shepherds felt that night, running through the town telling everyone that Jesus was born. Immanuel! Immanuel! Imagine how these two people felt, running to their friends in Jerusalem, telling everyone that Jesus was alive. Immanuel! Immanuel! The Bible tells us that God is love. And Jesus is God with us. Jesus is this love. And this love can change the world. You don’t always expect it. It’s a baby instead of a king. It’s shepherds and strangers. Because sometimes God shows up when we least expect it. When have you found God when you didn’t expect it? When have you found Immanuel, God with us, and just had to tell someone else? This is what our new kind of Christmas is all about. Immanuel! God is with us! Discuss students’ questions they wrote down. How do you think the shepherds felt when the angels showed up? How do you think they felt when they found Jesus? When have you found God when you didn’t expect it? How can you help other people find Jesus and know that God is with them (Immanuel)? Open your Bible to Luke 2:8. Read through the story of the shepherds and the angels. Divide your group into shepherds and angels and act it out! Nick Diliberto is the creator of PreteenMinistry.net, which provides creative curriculum and resources for preteen ministry. He is also the preteen columnist for Children’s Ministry Magazine. Tony Kummer (Editor) reviewed & updated this page on : December 4, 2012 at 10:49 am. All our content is peer reviewed by our readers, simply leave a comment on any post suggest an update.